Acquisitiveness describes the greed to increase one's possessions, to acquire, hoard and save. It can be aimed on material or immaterial fields, depending on the development of other faculties. It stands for the love of oneself's capital and is thus basically an self-centred faculty. On the lower parto of the temple, below Ideality. 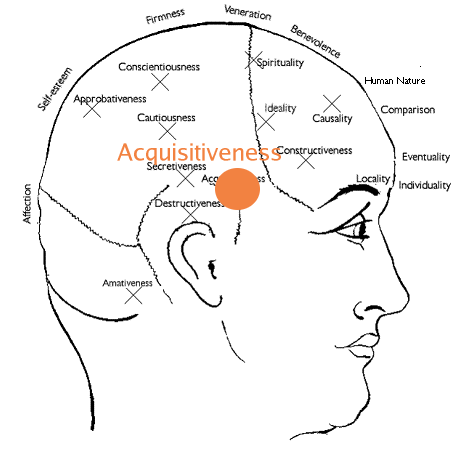 Acquisitiveness + strong development of Intellectual faculties: quest for knowledge, academic titles,..
Acquisitiveness + positive Constructiveness + positive Perceptive faculties: business and commercial propensity.